I went through some of my growing stash and folded the items that were FQ's and placed those on my CD rack. Looks great! The smaller, odd shapes I cut into 2.5" strips, squares, tumblers, strings etc. What do you do with your fabric that is smaller than a FQ, but too big to really cut it into tiny squares or strips? How do you fold and store? Help....I have a lot that fits into that category!! Ha ha, fold and store? I throw mine in a fold out laundry bin. Last edited by Tartan; 01-09-2018 at 11:59 AM. I starch them and put them flat into a bin marked "large pieces". This is where I draw from to cut and swap 2 1/2 squares for the Birthday Swap or DJmats quarterly charm swaps (or your 5" color swaps in case one Fat qtr is a little short and I have to find a few 5" squares) I also pull from them for appliques or small blocks. I have mine sorted by color in plastic shoe boxes. Like you I get a lot of leftover pieces from friends and have found that this is the best way to store them...when I need a strip of a certain color I know where to go. I also have size sorted bins for common cuts, i.e., 1, 1 1/2, 2, etc. I consider these scraps, and have clear shoebox bins to sort them by color. Whenever I need a small amount of fabric, this is where I look first. I make a lot of scrappy and controlled scrappy quilts, so I like them sorted by color. Jane, that is a great idea with the label of "larger pieces". I'm liking the idea of clear boxes to store by color. I have a feeling I need a Lot of boxes! I think that is going to be my challenge this weekend, if I can talk my daughter into helping me. I love the feeling of getting everything in its place. Makes me want to tear into those boxes and start planning something fun! I have one of those 3 drawer plastic units that Target sells for cheap for storing my fabrics that have been cut into. One drawer is for “smaller than a yard” pieces and the other drawers are for “smaller than a fat quarter but too big to cut” drawer. I wrap them around cut dwn comic book boards and put them in the drawer in rows arranged by color- wrappng them around the comic board allows me to stand them up so I can open the drawer and see at a glance what I’ve got. For my purposes I consider anything over 10” square too big to cut. If you haven't gotten the clear boxes yet, how about making fabric boxes from the scraps...green box for green scraps...red for red scraps...you get the picture, plus you use up the scraps. You can measure your shelves to get a custom fit. I've had the clear boxes, but would consider making boxes as a couple of the plastic ones have cracks in them. I cut mine into 2 1/2" strips, largest possible squares (5 1/2"), finally smallest possible usable squares (2 1/2"). Smaller pieces or odd-shaped pieces go to a friend who does art projects. Last edited by Aurora; 01-10-2018 at 02:48 AM. This is certainly a problem we all deal with. I know I do. I store fabric, 1 yard and less, folded to fit into 12 quart plastic sweater boxes. Each piece has a label with the measurement.I ruler fold pieces that are around 2 yards and store them, rainbow fashion, on an open shelf unit. Larger yardage is stored on the bolt boards that I ask for in the stores. They are stored along a wall where I can easily see them. When I cut, I change the label. I generally tuck scraps into the folds for later use or when I need small pieces. When a piece of fabric gets smaller than will fold into the 5 by 9 inch configuration I put into gallon size plastic bags sorted by color in a group of drawers. I want to do some scrappy projects at some point. I am afraid to cut into strips and squares because that size might not be what I need later. I find it is important to me to put away everything from one project when it is complete. I have also used these clear containers to organize projects I'm working on and don't want to forget about. Of course, the smaller ones, like strawberries come in, are great for 2.5" squares. Oh! Scrappy fabric Boxes....interesting idea! I do like boxes with lids, though. But...that did give me an idea for boxes in my linen closet for meds, and smaller things that always get jammed everywhere. Nice idea, thanks! Zozee, you are an organzing Goddess! Look at that prettiness! Copycat: Now that it's January and I have to (someday) start my diet, those salad containers would make great bins. Clear, lightweight, and more importantly, not in the landfill! Thanks for the idea of using salad and strawberry containers. Red, I don't like the lids on..I trim as I use fabric and the open containers on the sized boxes save a lot of time as I dump them into the box. We all have our own habits. A big plastic tub that I keep in the closet! I bought 5 giant zipper sealed plastic storage bag. All my small scraps (less than a Fat eighth) roughly colour coded, go into those bags. I sit on the bags before I seal and store them so a lot of small but useful pieces can fit in a small corner. I can find pieces without opening the bag to hunt..
Zozee has the right idea but I don’t have that many scraps (yet). I separate mine by strips, crumbs and larger pieces and store them in fish totes w/lids so they stack. We purchase haddock in 20 lb totes for our chowder each summer for our business and end up with at least 25-30 totes each season. My friends like them to store Christmas ornaments and things too. I sit on the bags before I seal and store them. Too funny...I use little zip locks in bigger zip locks...think of the Russian nesting dolls. I have totes for size strips 1, 1.5, 2.0 2.5,3.0 5.0 and large pieces. Those that are too large but smaller than a fat qtr that I don't care to cut into. I find these come in handy from time to time. Just yesterday I found some red large scraps to use as the back for my bluejean mug rugs. Perfect for 4 of them plus now have a smaller piece of scrap to put into the 5.0 tote. 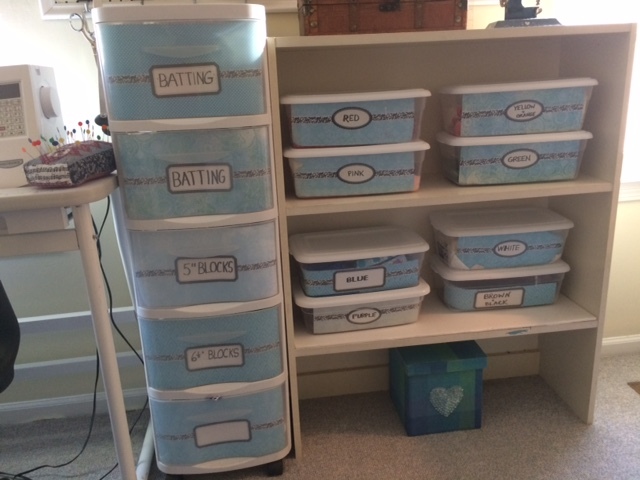 I ran across this tutorial just the other day to make easy scrap storage bins. Suzi, those are Great bins. And I love the fact they are all the same color, but with color indicators on the top. I bet those go together quickly. Last edited by QuiltnNan; 01-20-2019 at 01:36 PM.